STEP RIGHT UP, LADIES AND GENTLEMEN and suspend your disbelief as we invite you to experience the greatest show on earth! Based on the life of Phineas Taylor Barnum, BARNUM The Circus Musical will show you every sight and wonder that name stands. Witness Jumbo, the largest elephant in the world, Joice Heth the oldest woman to ever live, and the most beautiful operatic voice to ever appear on stage, the Swedish Nightingale Jenny Lind. 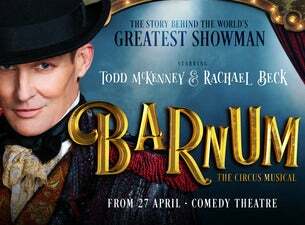 Starring in this magical all-new production of the award-winning Broadway musical is Australia’s Greatest Showman Todd McKenney as P.T. Barnum; and Rachael Beck as devoted wife Charity Barnum. With music by Cy Coleman (Sweet Charity), book by Mark Bramble (42nd Street) and lyrics by Michael Stewart (Hello Dolly! ), prepare to witness something extraordinary, BARNUM is the must-see event of 2019! BARNUM The Circus Musical arrives at Melbourne’s Comedy Theatre this April for a strictly limited 6 week season.